Implant supported dentures can bring back normal function and a confident smile. Conventional dentures may not be your only option for replacing your teeth. 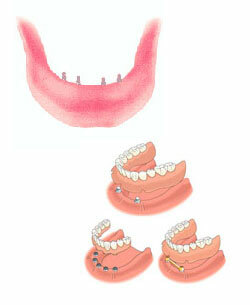 Implants can be surgically placed below the gums and serve as a strong foundation for the fixed or removable denture. They are stable and there is no worry that the dentures will slip. They will give back your smile and you feel better about yourself. You will be able to chew more efficiently and without pain. Implant supported dentures can bring back normal function and a confident smile for people who are missing many or all of their teeth.